In the idyllic moments before sundown, the slant of the sun's rays often sketch a sentimental hue over the landscape. Those moments of gloaming have been scribed in time by many a poet and artist, and Jonas Kyratzes takes it a step further in Arcadia: a Pastoral Tale, an interactive fiction game of exploration set in a dateless pastoral state. Kyratzes, who also created one of 2011's best, The Book of Living Magic, says Arcadia "is not a race... It is a stroll, an afternoon walk." Keep that in mind as you play. Play, in this case, means reading the text, pondering the circumstances, and choosing your next action by selecting a highlighted word. The path you travel depends on your choices, with multiple options bringing several new discoveries. Because of this, you'll want to play through more than once. As for what the game is "about," since discovery is an integral part of playing Arcadia, let's leave that unsaid for now and talk instead about its merits as a game overall. Casual gamers realize the general public doesn't give our esteemed game developers enough notice or credit for their creations, that there is sometimes a prejudice against this artistic domain as if its moniker denotes insignificance and immaturity. Without knowing the depth of lyricism and creativity that can compose a game, they'd even mistake the entirely textual Arcadia as not a game. What defines a game is as varied as what defines a sport. Games are distinct from work; they're entertainment, an amusing pastime, and involve the player at some level. Good games are more than that—they resonant with their players at an innate level, tapping our logic or reflex or dexterity in pursuit of a goal or a win. Arcadia does all of this by providing choices then rewarding our decisions lavishly with rich prose. Absent is the possibility of losing, but winning or losing are only a means of providing resolution at the end of a game. It is here that Arcadia excels the most because Arcadia's denouement is naturally beautiful, surreal and meaningful; it is as if Thomas Cole is the player's muse, that this isn't a narrative simply told to you, it is an archetypal romanticism in which you're enveloped; you play for the experience, for the discovery, and for the escape. 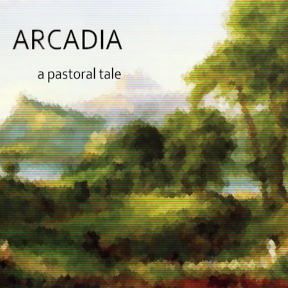 Arcadia: a Pastoral Tale elevates the oft undervalued browser game onto the loftier plane of artistic poignancy. "there is sometimes a prejudice against this artistic domain as if its moniker denotes insignificance and immaturity"
Clearly those people don't play our games. I spent two hours last night trying to find something to play on my PS3 that came even CLOSE to the experience of many of the "casual" games I have been introduced to here at JiG. I ended up deleting seven demos because none of them were remotely significant or mature enough for my notice. A new Kyratzes. This is a good day. This is absolutely gorgeous. So very intimate and moving. I could feel myself getting completely immersed, the mark of a wonderful game, to be sure. Truly beautiful in its simplicity. The storyline is sounding like some kind of post-post apocalyptic world. Except that the world isn't a bomb-shattered radioactive wasteland. And... the story ends abruptly. While it's definitely a great story, it seems a little too linear for my preferences and the sudden ending of it makes it feel like the story is too short. Yes, I was expecting different paths to lead to different endings so we'd know what was going on in what I thought was the "first" ending. This failed to receive 5 stars because of the abrupt change in the mood and tone of the story and the fact that every choice forced me to the same bottlenecks later on in the story.